In a victory for a free and open internet, the US Senate voted yesterday to repeal the Trump administration's rollback of Obama-era net neutrality rules. Net Neutrality is the principle that Internet service providers (ISPs) must treat all data on the Internet the same, and not discriminate or charge differently by user, content, website, platform, application, or method of communication. Democrats were able to force the vote under the Congressional Review Act, which allows Congress, with a simple majority vote in both houses, to pass a joint resolution and overturn recent agency decisions. The joint resolution passed 52-47, with the support of 49 Senate Democrats and three moderate Republican Senators -- Susan Collins (Maine), John Kennedy (Louisiana) Lisa Murkowski (Alaska). In February of 2015, on the recommendation of President Obama, the FCC passed the Open Internet Order, which reclassified broadband internet service as a telecommunications service. In doing so, it prohibited internet service providers (ISPs) from restricting the flow of data to and from websites, or segregating the internet access by cost -- therefore preserving net neutrality. The historic 2015 regulation established "net neutrality" as the internet's guiding principle and the law of the land. In December of 2017, the FCC, under new Chair and Trump appointee Ajit Pai, voted 3-to-2 along party lines to repeal the Open Internet Order, claiming it constituted regulatory overreach by the FCC at the time. Supporters of the repeal hailed it as a victory for investment and innovation. The action was immediately decried as a violation of the First Amendment's right to free speech by denying equal access to any part of the internet to any individuals, based on their ability to pay. Twenty-one states and DC subsequently filed lawsuits against the action. A December 6-8, 2017 poll by the University of Maryland showed that 83% of Americans favored keeping the FCC rules, including 75% of Republicans, 89% of Democrats and 86% of independents. 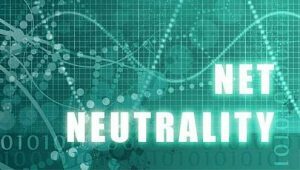 Proponents of net neutrality include consumer advocates, human rights organizations, online and internet application companies, Electronic Frontier Foundation, ACLU, Facebook, Google, Microsoft, Netflix, Reddit, Vimeo, Yahoo!, Vonage, eBay, A mazon, IAC/InterActiveCorp, Re ddit, Twitter, Tumblr, Etsy, others. Opponents include internet infrastructure service providers, AT&T, Comcast, Verizon, National Cable & Telecommunications Association, National Music Publishers Association, US Telecom & Broadband Association, Time Warner Cable, Cablevision, Cisco, Tekelec, IBM, Intel, Panasonic, Ericsson, others. The Senate vote, however, was largely symbolic for now as it still has to go through the House. That will require a simple majority of 218 to force a vote, which means securing the support of all 193 Democrats and 25 Republicans in the GOP-led House. A companion resolution has already been introduced in the House by Congressman Mike Doyle (D-PA). Regardless of the immediate outcome, the bi-partisan support for the issue among voters themselves could prove to be an advantage for Democrats at the ballot box in November -- particularly among younger, internet-savvy millennials.